NORTH BAY — North Bay sidewalks remain near insurmountable after normal levels of snowfall have left them obstructed, with some local citizens taking it upon themselves to clear the paths. But fear and chaos have run rampant since Friday morning when City Councillor Grey Terrence, the new interim Chair of Engineering, Public Works and Environmental Services, declared a state of emergency from outside his Callander home. The North Bay Police held a press conference Friday afternoon following Terrence’s declaration. There, Sergeant Jeanette Lawrence explained exactly what a “No Man’s Land” means. 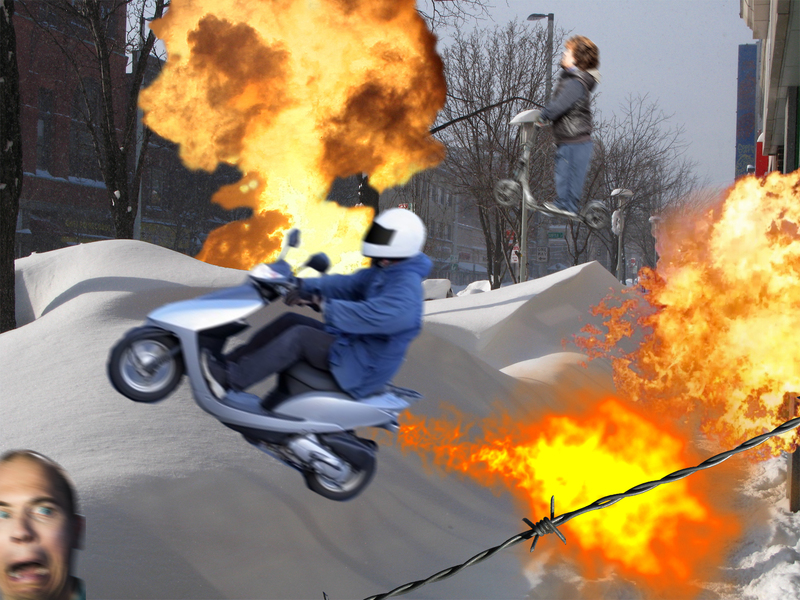 Since Lawrence’s announcement, reports of gang violence on City sidewalks have begun rolling in, with an alarming dispatch that the infamous “Scooter Gang” have claimed sections of Cassells Street. The Hood Punchers have also reportedly punched several cars directly in their hoods. Meanwhile, rogue council members have taken to the sidewalks outside their Airport homes with baseball bats, nunchuks, and in one case, a pillow case full of 200 freshly-minted North Bay coins.